I mentioned in a previous post that after ticking a few things off of my summer to do list, I was able to think enough to pick up my needles again. 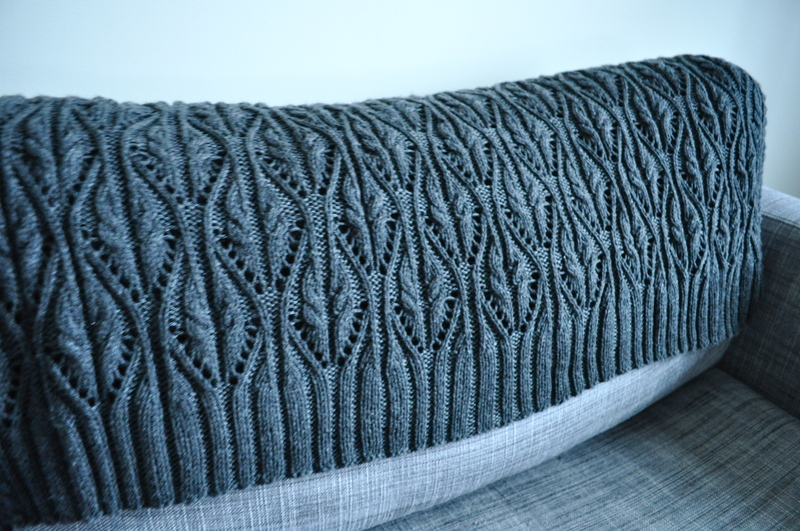 I decided to get back into the game with another Brooklyntweed pattern – actually it’s an Anne Hanson pattern for Brooklyntweed’s “wool people vol. 1” – the hourglass throw. The pattern calls for Brooklyntweed’s Shelter yarn, but I wanted to go with something washable and decided to use Knit Picks Swish Worsted in Cobblestone Heather. The yarn is nice and lofty, so the cables really pop. I tried out steam-blocking for the first time with this pattern and I can’t decide if I like it better than wet blocking or not – it’s easier for me to get the blocking wires in when the project is dry, but I don’t feel like the pattern opened up as much this way than with wet blocking. Any opinions on wet versus steam? The stitch pattern looks really complicated, but there isn’t actually that much cabling (only the small cables contained in each hourglass and the two on each side), so once I got the pattern memorized the knitting went pretty quickly. 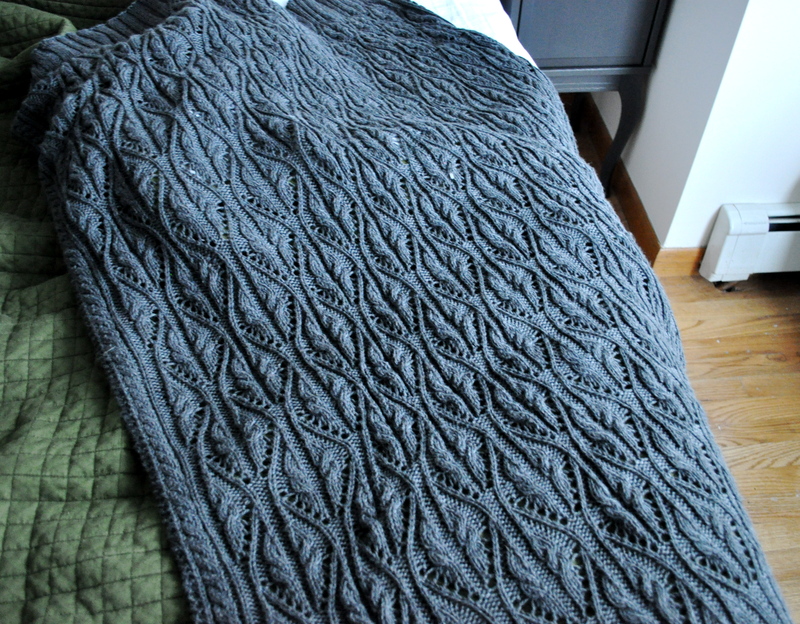 I really like the little cables running up the side, and also the idea of ribbing on a blanket. Believe it or not, this is actually the first blanket I’ve knitted that will be staying in my home! I’ve knitted a few blankets for others, and pretty much enjoyed every pattern I tried, but once the blanket I was gifting was finished I never really felt like taking on the same pattern again. 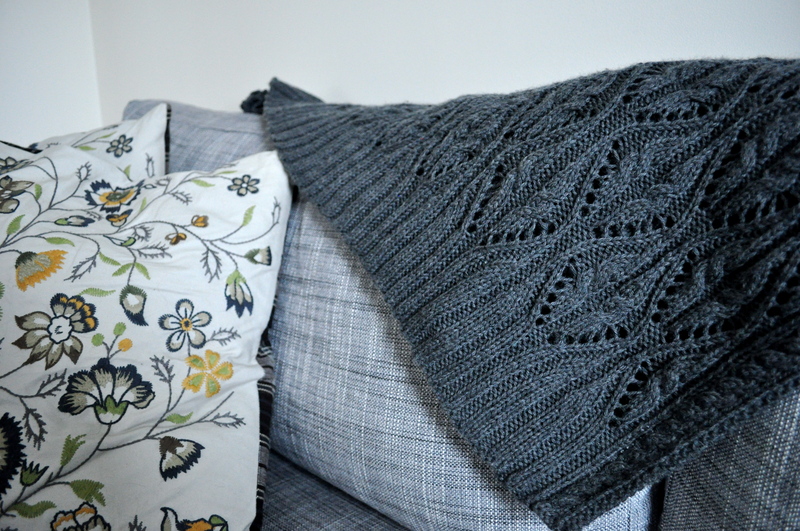 Now I’ve knitted a new blanket pattern for the first time and it’s all mine! Of course it had to be gray. 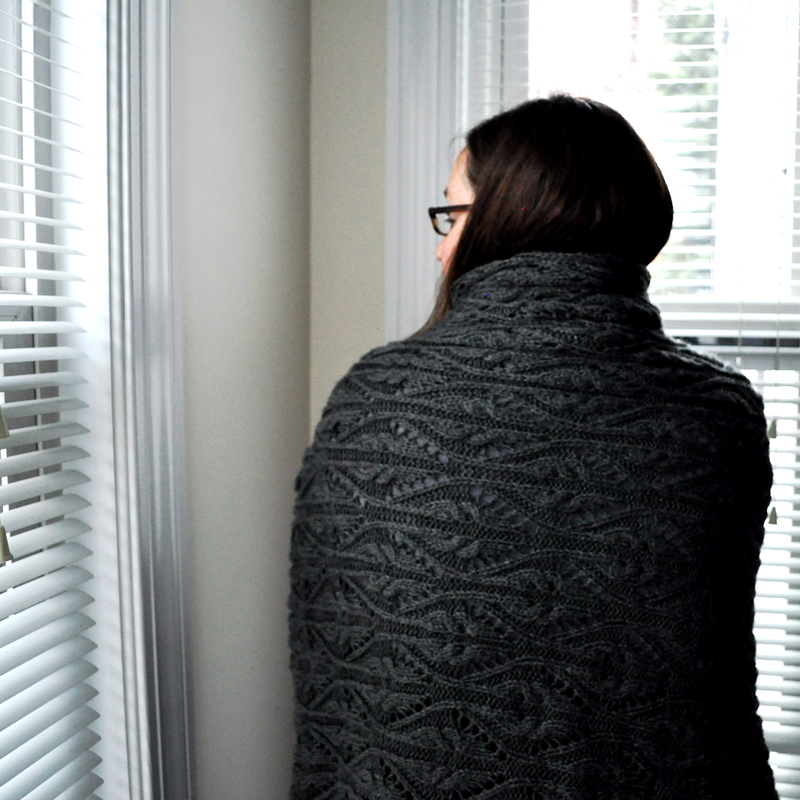 I knitted the medium size throw from the pattern, so it’s just big enough for me! P.S. Sorry for the kind-of-dark-and-blurry photos – it’s been overcast here for daaayyys, but I really wanted to post about this project so I just decided to go for it! Maybe I’ll update later if I get a chance to take some better pictures.